I am a sucker for nailpolish. Plain and simple. My collection of polishes has outgrown its home and i’m now considering getting a wall mounted holder..you know…like the ones you see in the salons. Pathetic, right? My hubby doesn’t understand what the difference is between OPI’s “I’m Not Really a Waitress” and Essie’s “Head Mistress”…duh..about one tenth of a shade!!! 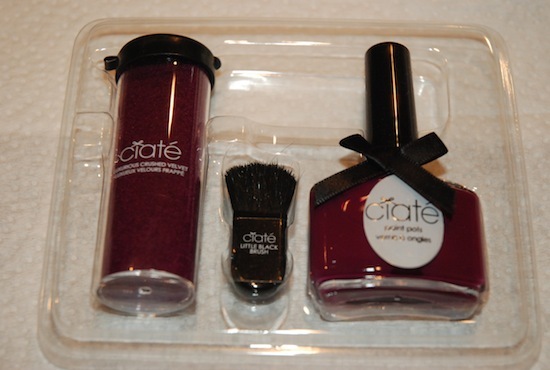 But, Ciate’s line of products don’t count in the tally because they’re not just polishes. They offer completely unique and hip finishes. 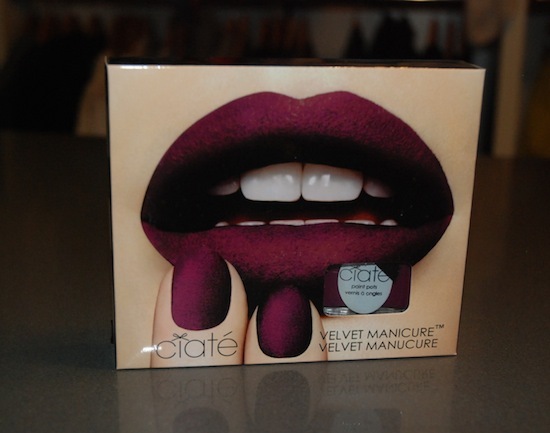 I told you about the Ciaté Caviar manicure a number of months ago, but this crushed velvet mani might just be one of my favourites, especially during this time of year. 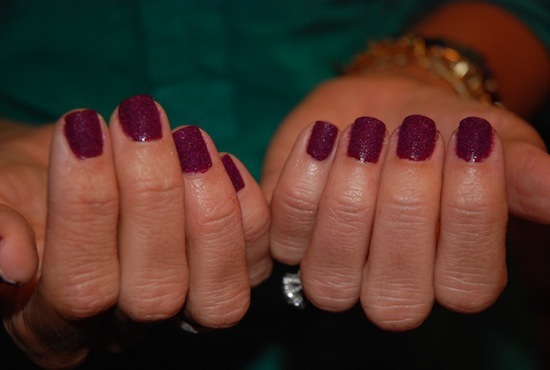 Rich and luxurious, the velvety finish is somewhat like a matte finish, but with a softer, more textured result. I’ll admit i was leery that the finish wouldn’t last more than a couple of hours, or a handwash…whatever came first. But surprisingly, it survived both, and 24 hours later the velvet while slightly diminished is still holding it’s own. 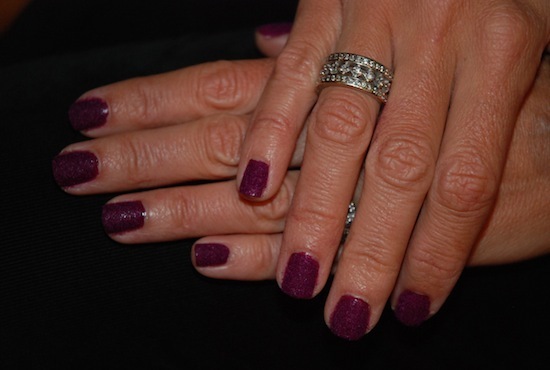 I would consider it a special night polish, almost like an accessory…but you can still wear it for days longer. I’m ok with the the slow fade of the velvet…still looks funky to me. 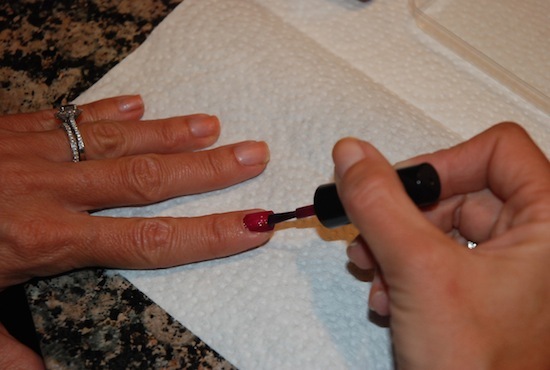 Just three items: the polish, the crushed velvet and a mini brush to wipe away strays. Paint first coat on all nails. Next, take one nail at a time. 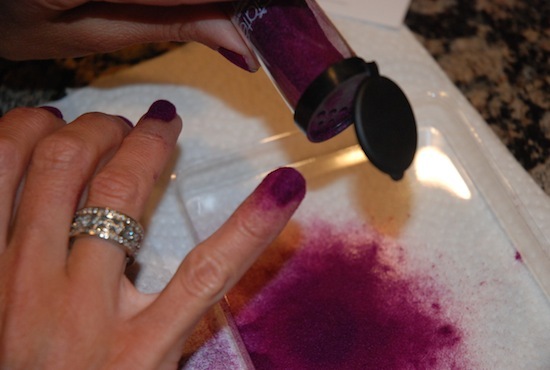 Paint a second coat on and immediately sprinkle a generous amount of the crushed velvet on. Make sure you cover the entire nail. Then gently brush away the extra velvet. DONE!! 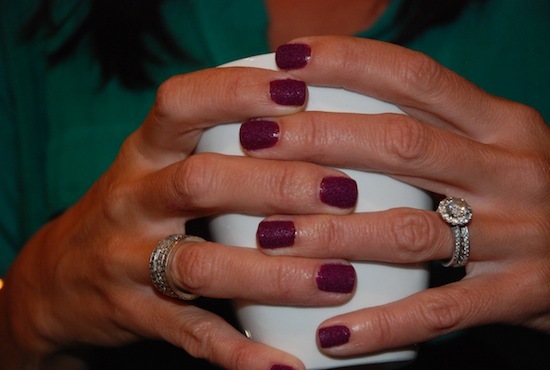 In a couple of simple steps, you’ve got yourself a luxurious mani!